This is the story of a farm in Walworth County, Wisconsin, that began with a few acres in 1868 and grew to a 160-acre family farm. Over many years it supported and provided the rich background for four generations. 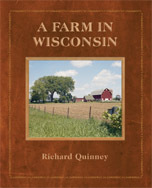 Told from the perspectives of the descendants of Irish, English, and Scottish emigrants, as revealed in letters, diaries, photographs, and documents, this unique book offers a moving portrait of the life on this Wisconsin farm. "This farm, to which I am native, I want you to know about. I will describe the farm to you in words that come as I think about and imagine the lives of those who once lived here, inhabiting these few acres of rolling hills and wetlands in southeastern Wisconsin. To anyone who will listen, I have a tale to tell. The farm has belonged to my family for four generations. Settled by my great-grandparents fleeing the potato famine in Ireland, it is the place of my birth and early years. The house at the Old Place was torn down many years ago. The well was filled with rubble to keep anyone who might be passing by from falling in. All that remains of the house that had been built by my great-grandparents John and Bridget Quinney a few years after they arrived is the crumbling foundation. I return repeatedly to view the ruins and walk the grounds. Even now in early spring you will hear the mating calls of frogs coming from the pond at the foot of the gently sloping hill. In winter when the pond is covered with snow, muskrat houses protrude through the ice. When spring comes again, ducks and geese nest and raise their young among the reeds and tall grasses at the edge of the pond. Red-wing blackbirds establish their territories, calling from the tops of cattails. Sandhill cranes build their nests at the edge of the marsh. Prairie grasses and flowering plants and oaks and hickories grow on the hills that rise beyond the Old Place. When we were young, growing up in the thirties and forties on the farm, my brother and I would look across the field to the Old Place and wonder about the lives of the generations that preceded us. With the passing of years, as we moved away and lived our lives in other places, the magic of the Old Place only increased in our imaginations. In times of need, as well as in times of ease, I would return to the Old Place to find solace and renewal. I go there regularly now to know that I am an intimate part of the place that is still my home, and to be reminded of the ancestors who have gone before me. Among the things that were carried up to the farmhouse when our great-aunt Kate died in 1942 were the albums of family photographs. The sons and daughters of Bridget and John, and their sons and daughters, made the photographs as they documented their lives at the Old Place and at the farm. A few letters, some diary entries, and a scrapbook of obituaries survive for the historical record. In addition, there are the photographs in albums from my mother?s family. And there are the many photographs from albums made by my mother and father from their young lives, and there are the photographs of their early years together after they married. With my birth in the mid-thirties, followed by that of my brother, the years of the growing family were well documented and preserved in family albums. We, my brother and I, are now the keepers of the farm. Gradually we are converting the farm into sustainable agriculture. Our hope is to make the whole farm into a natural habitat. In the meantime, I have photographed the remains of the farm from earlier times. With camera in hand, I made my way to the barn, to the machine shed, to the chicken house, and to the farmhouse, photographing the artifacts of the life that once was here. These photographs pay homage to the ancestors that made this farm. The past becomes a part of the living present. Lifetimes are burning in every moment. This farm in Wisconsin that I continue to write about was made by emigrating ancestors, by ancestors who were born here, and by those who left the place—by all those generations who have been shaped by these few acres of earth and home. These are the ancestors that I have remembered, telling the stories that have been passed to me, stories in words and images that document their lives. There is enough here to know that we are an intimate part of those who have come before us. Our lives continue—in body, mind, and spirit—from their lives. In this real sense, there is no birth and no death. There is only the one river of life that keeps flowing, and we all are part of it. We know that our ancestors are not merely of a former time. They are with us always, in our daily lives, just as we will be in the lives of those who come after us." This book is an expansion and redesign of the earlier book Of Time and Place, Borderland Books, 2008, ISBN 978-0-9768781-2-4.